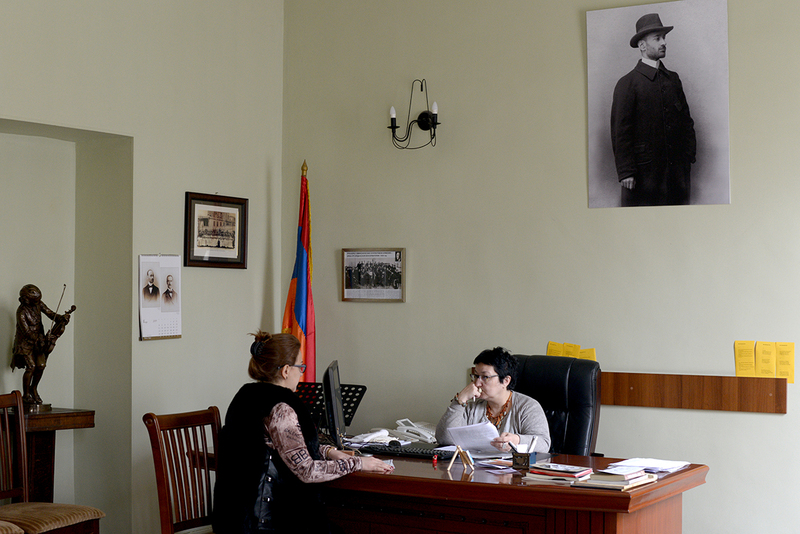 Sona Hovhannisyan in her office of Conservatoire. 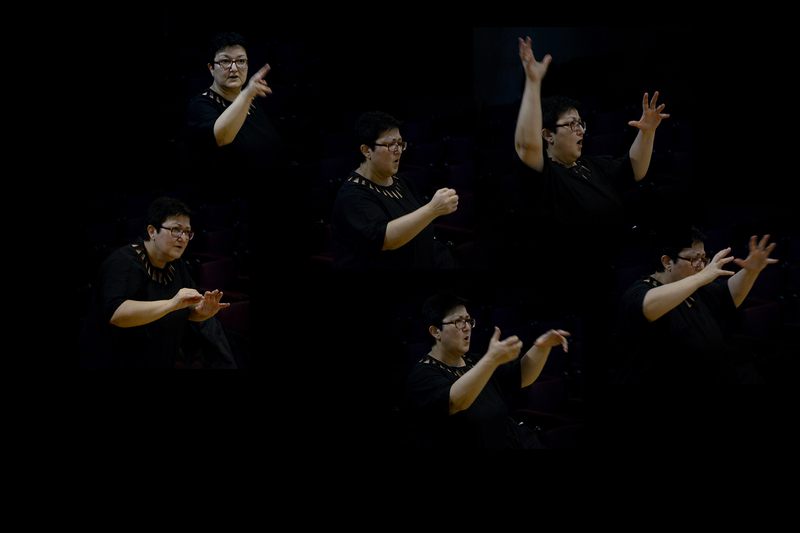 Sona Hovhannisyan is a conductor of “Hover” State Chamber choir. 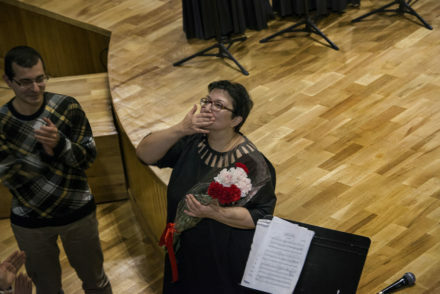 She is the first female rector in the history of the Komitas State Conservatoire of Yerevan. I think I am not strong at all. I have passed through hard things, but when I compare, I see that I have had a very soft life compared to the lives of those intellectuals, musicians, poets – hardest times… when people could vanish for their own thoughts. A person like Mandelshtam in those jails, in exile, under those pressures, terrible things have happened, this is why our time is very humane, reformed, and even in the nearest past we didn’t have those opportunities that we have today. I don’t know why Mrs. Shushik was good, but Mrs. Tamar was bad… and later, this one thing – wonderful, the other one – no… After Chekhov’s puzzled thoughts about this I understood that there was no need to make it clear… and I wholeheartedly loved the wonderful and the unparalleled, the unparalleled of our melody “Havik” and all the unparalleled of the world. There is no more valuable occupation, than this… I entered the world of music. There began my numerous hugs and quarrels with life. But happiness was omnipotent… it cured the unrecoverable. Only the spring lived with people was left, everything else vanished… After the loss of my friends of young years and the longing for them there shines only the excitement of my vital days, row by row, bead by bead the “crumbs” of our Komitas, the clear air and the dangerous creations of my “Hover”. The happiness is very exciting and indecipherable, they haunt you all the time and remind about themselves. 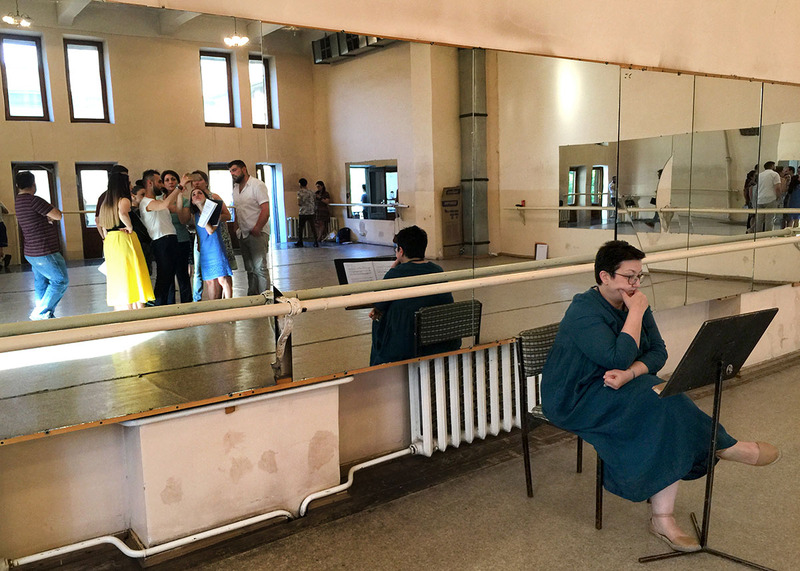 The director of the opera performance “Sasuntsi Davit” (David of Sassoun) is working with the choir for the staging. Yerevan, 2017. 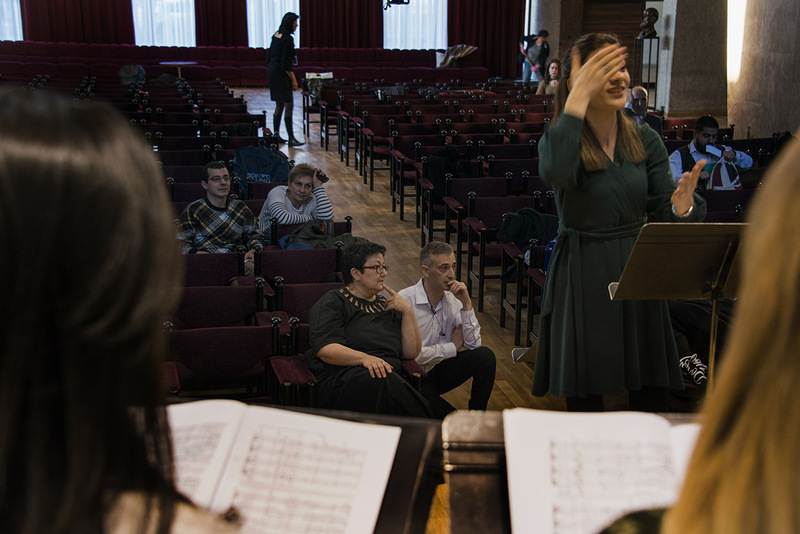 Sona is discussing some details with a member of the choir – Areg – before the concert. 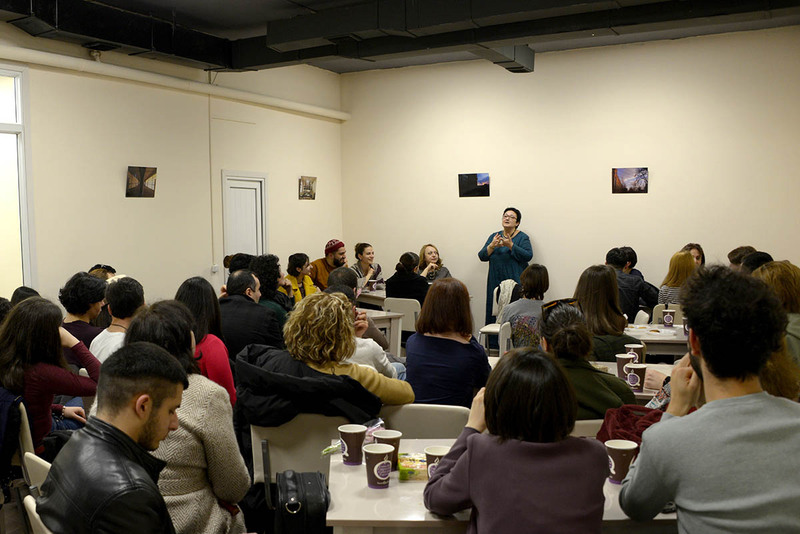 After the author’s evening of the Armenian composer Arthur Avanesov, held on February 19. 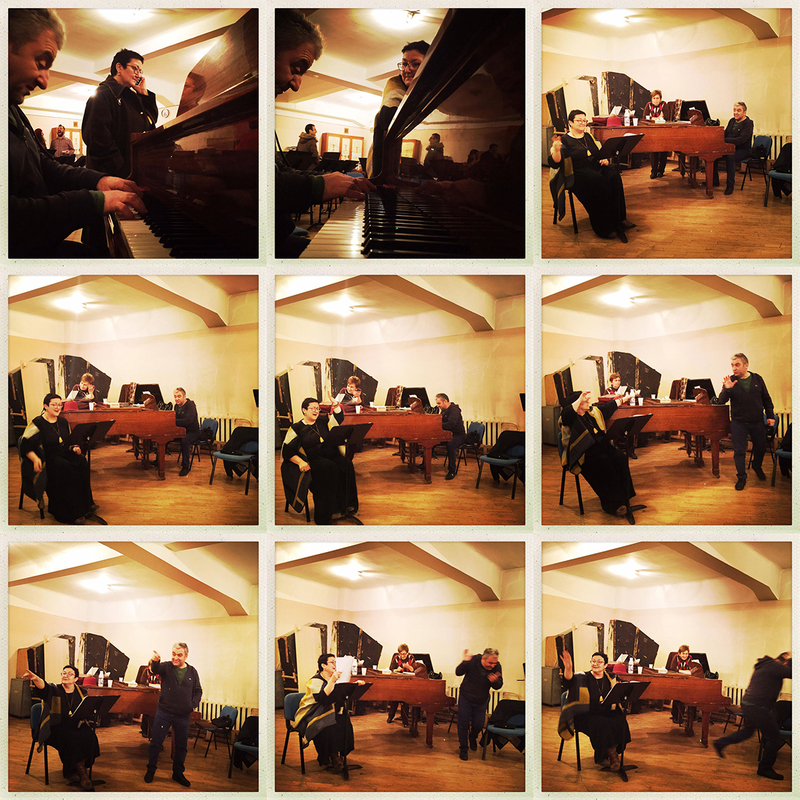 The choral works of Avanesov are much loved by “Hover” choir. 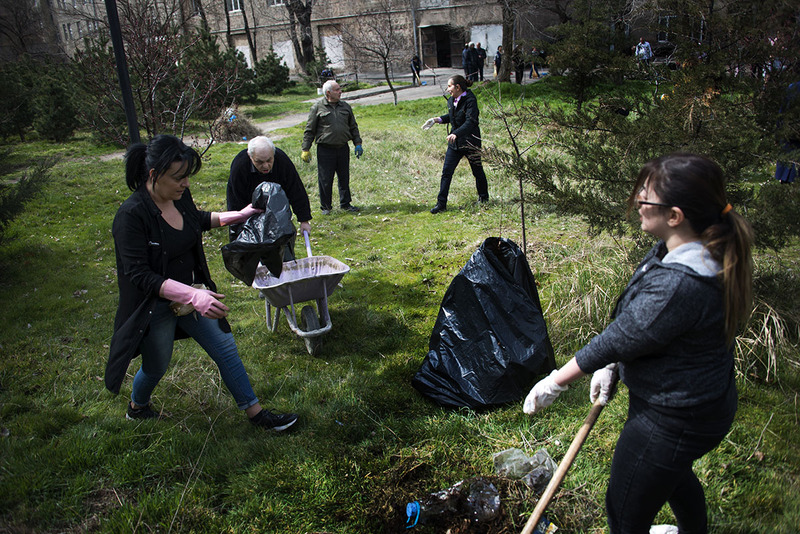 Yerevan, 2019. There is nothing greater than delight, happiness. I don’t remember any bad fortune, I just don’t remember, but those moments of delight I always remember, they are always with me. It’s interesting, but it’s like that. The relationship with people has been very complex, right? Especially in the beginning, when you are young, when life is taking you in a different way, you make mistakes, but nothing is remembered about that person, only the spring is remembered, when you have lived with him, finish! Only that. It’s very amazing, but it’s like that, it disappears from my brain, doesn’t exist. 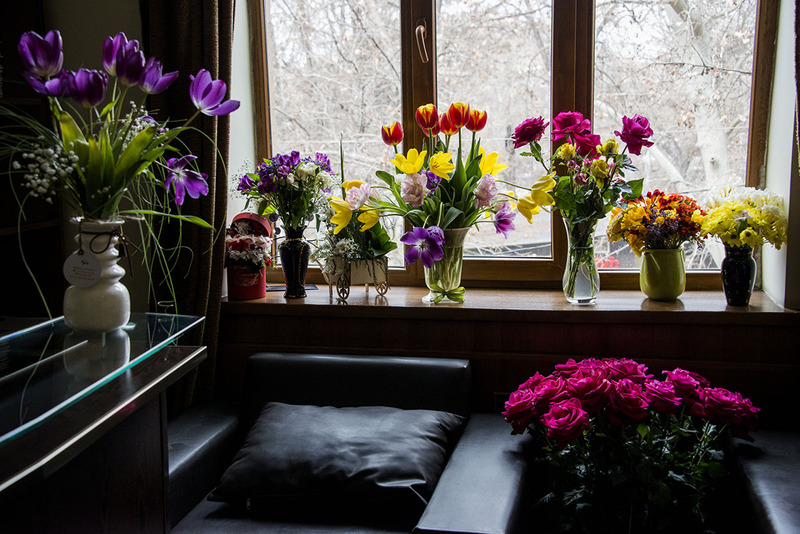 The reception of the Conservatoire is full of flowers. It was Sona’s birthday days ago. 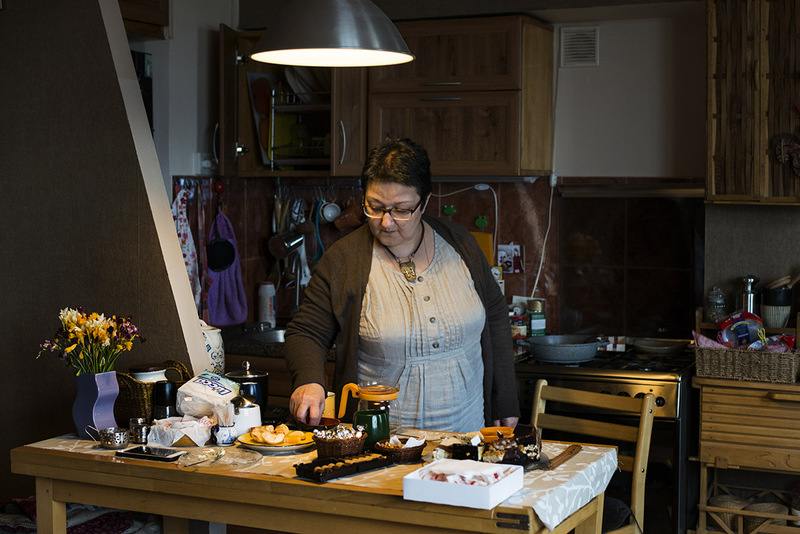 Besides being the master of her work Sona is a wonderful cook at home, and all the people around her can prove her endless hospitality. Her small, but openhearted apartment is capable of hosting a whole choir, often without any serious reason. 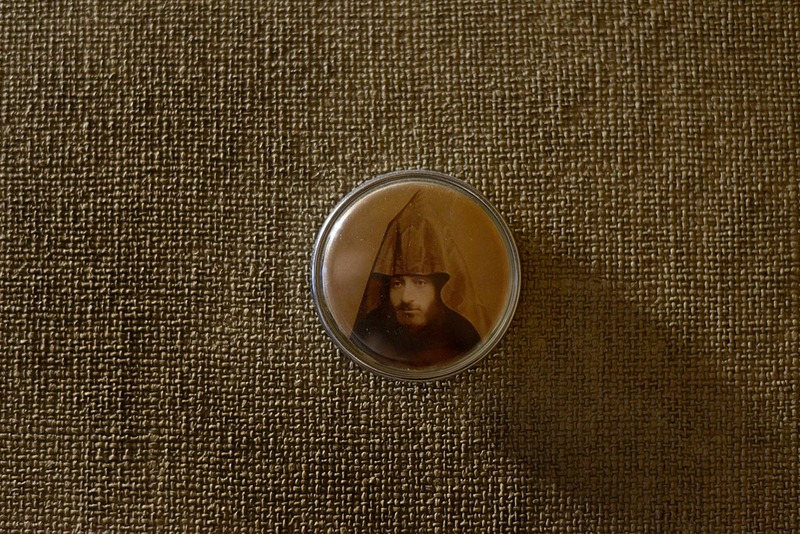 One of the few photos on the walls of Sona’s apartment – the small portrait of Komitas. The program of “Hover” choir is rich in multi-genre music of all the nations, but Komitas sounds especially warm in the performance of “Hover”. Recording at the recording studio of Kanaker. 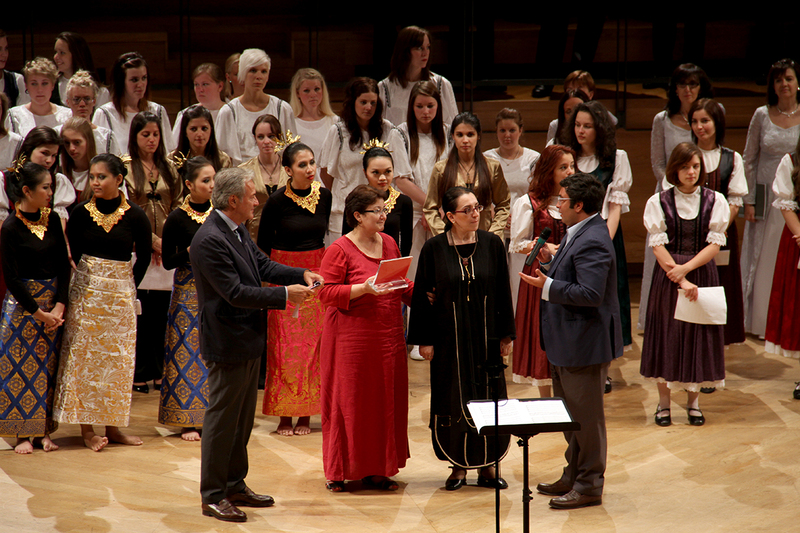 At the closing ceremony of the choir festival “Fabrica del Canto”. Italy, 2011. 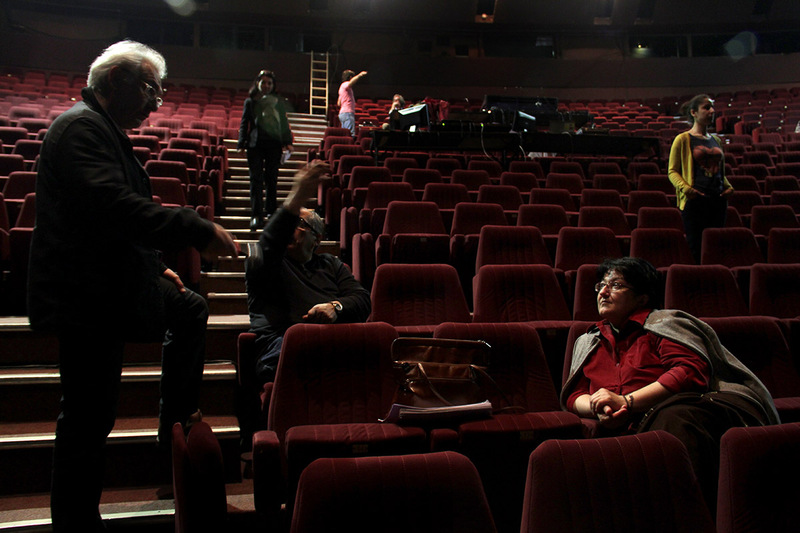 Sona Hovhannisyan and French-Armenian director Serzh Avetikyan at the Parisian tour of the opera “Anush”. Paris, 2013. 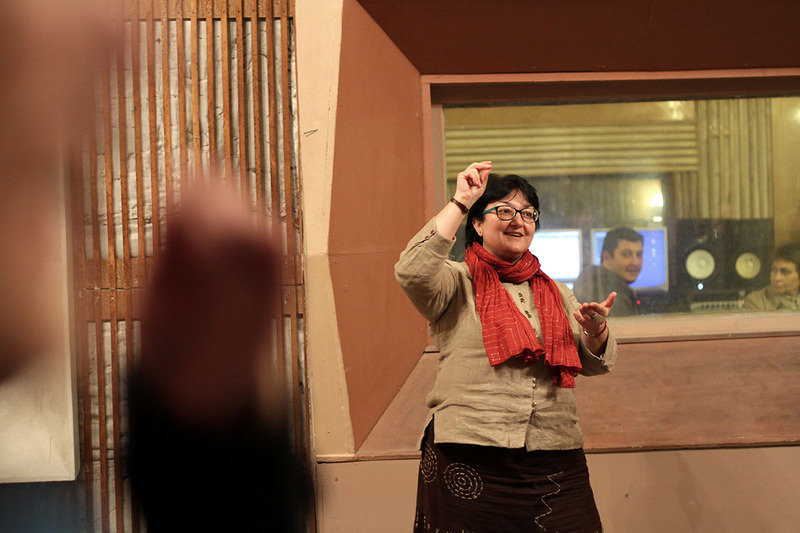 Sona and famous jazz musician Vahagn Hayrapetyan at the rehearsals of a joint project. No revolution, no formation, nothing creates such fundamental, mattering change as everyday work. It’s that everyday layer, the English lawn, that must be watered for 300 years, to have this result, no matter what you do, no other way is possible. Even water will make a hole in a stone, if it drops every day. Hover State Chamber Choir artistic director and conductor Sona Hovhannisyan appeared with a lecture on the Armenian monodic music in the frame of “Polyfolia” International Choir Festival. 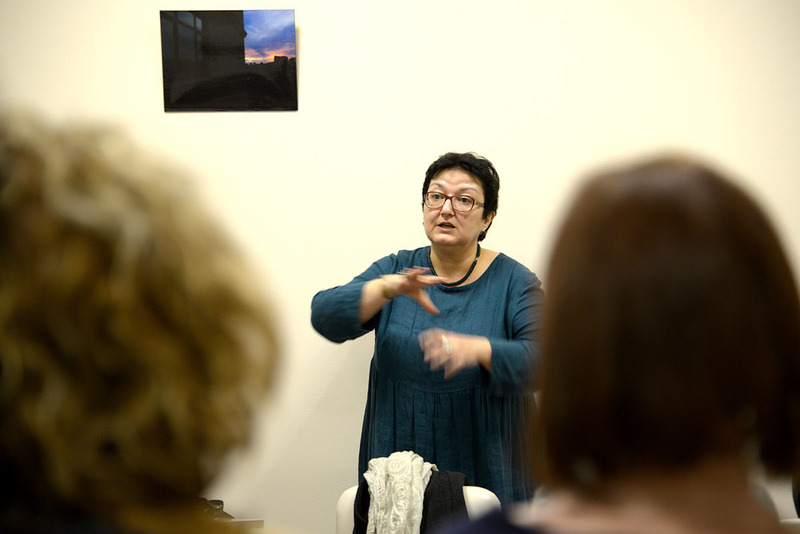 During the event “Sweet is the Moon” by Komitas was performed. The photo of Shostakovich her uncle has gifted her. Sona at home. Every direction that a person lives, both art, education, and everything else matters, but there is a more important thing – understanding the real flow of life, to understand what is more important in that flow, what is exciting. These are very important things, and if they are at their place, much is being self-created by itself. 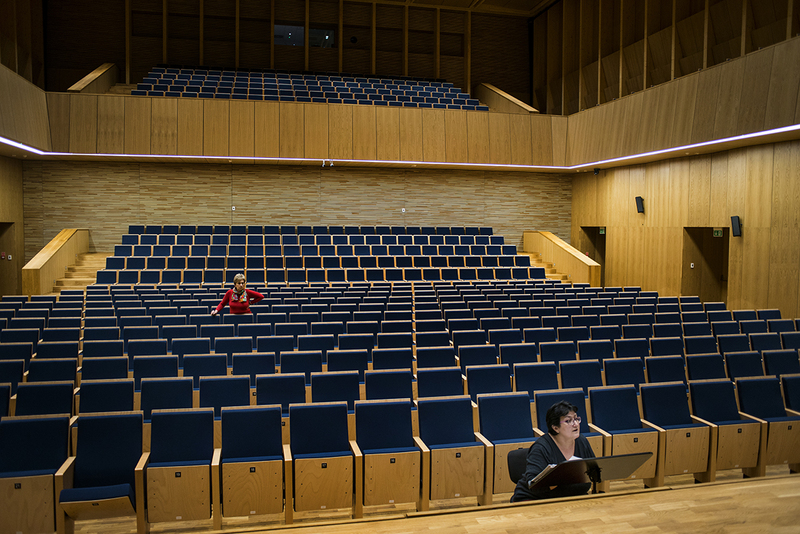 At the hall of Krzysztof Penderecki during the rehearsal. 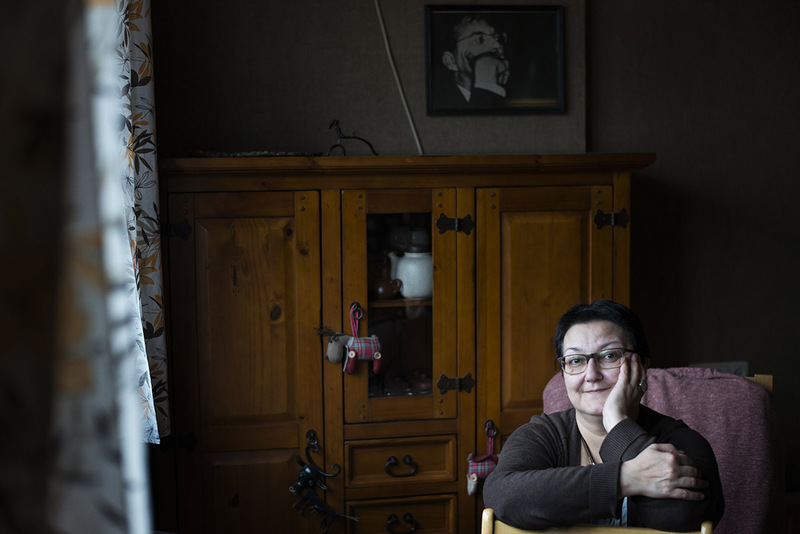 Luslawice, Poland, 2015. Much has changed after Sona’s appointment in the position of the rector of YSC. The conversations with the students with the lecturers and invited professionals often become a non formal, effortless, close and intimate tea drinking procedure, which connects the students to the institution, and the classes become enjoyable. Sona at the “tea drinking”. Weekend cleaning and tree planting in the yard of the Conservatoire. Sona is talking to the member of the law department of the Conservatoire. I think there is no going forward, it’s important to be in the spot in you, that you change in that spot inside you, no forward, no backward, left-right. My mother would say, ain’t it shameful, that a person has ambitions? The family I was formed in was not like others with its standards, with the accepted rules in the society. I have opened my eyes with other type of people, living differently, then I saw – wow, it occured to me that one had to have ambitions. There is nothing like that. 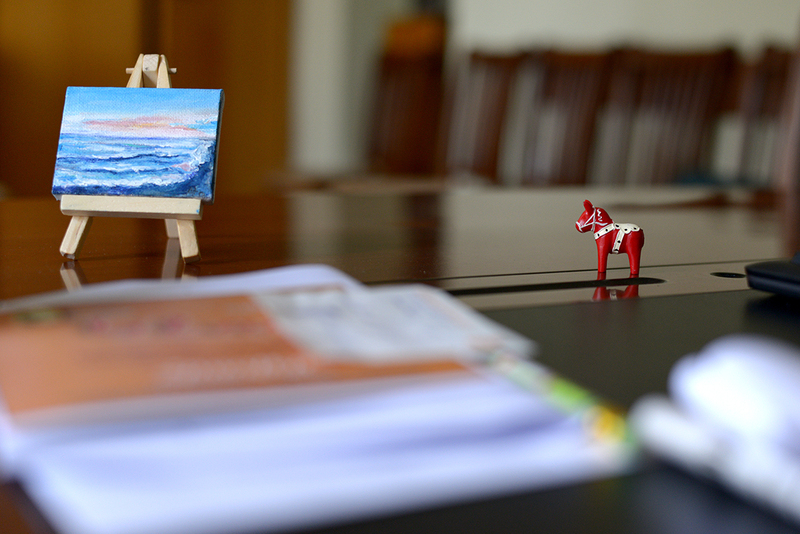 That day you are excited by something – an author, some music, and it’s only that, finish! It changes you in such a way, that one year lived suddenly suggests such a thing, that you begin to drown in pleasure. 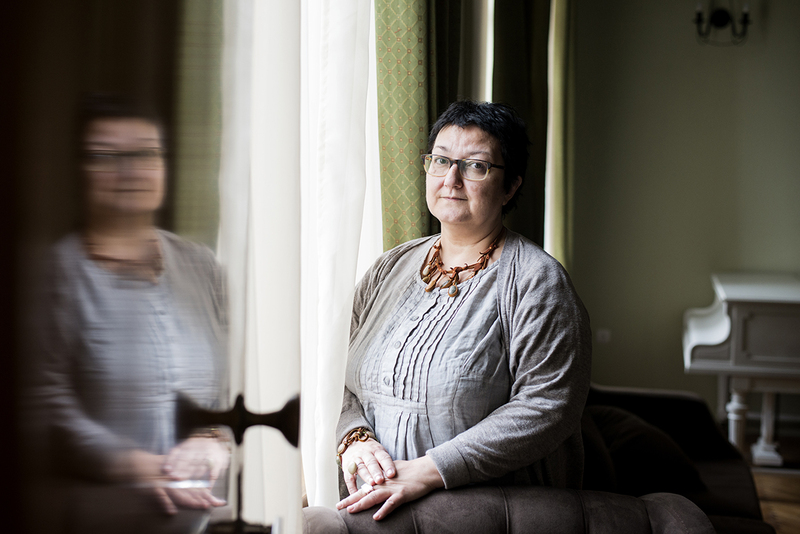 “Hover” choir at world-known composer Krzysztof Penderecki’s house in Luslawice. Poland, 2015.